Saudi authorities are about to acquire Israeli anti-missile system, Iron Dome system, to beef up its defense apparatus. The news was reported by Swiss media Basler Zeitung, which quoted a European weapon dealer as saying that that Saudis are looking into the purchase of Israeli military ware, such as the Israeli Trophy Active Protection System (APS). The Israeli technology can intercept missiles and rockets launched into Saudi Arabia with a ‘bust of metal pellets’. The equipment is developed by Israel’ defense contractors Rafael and the Elta Group division of Israel Aircraft Industries. 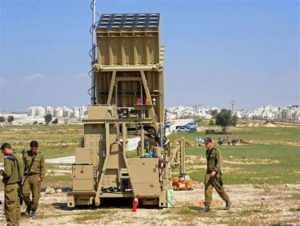 Israel boasts that the Iron Dome system was used to intercept Hamas-launched rockets towards southern, central and Northern Israel during the 2014 Israel-Gaza war. The Swiss media also noted that Saudi military experts tested the equipment in Abu Dhabi, United Arab Emirates (UAE). The Saudi kingdom and Israel have been working on rapprochement although there are no diplomatic ties between the two. Both countries have reportedly developed secret ties in the area of security, fight against terrorism and mainly cooperation against Iran that both countries consider their enemy. The move to buy the Israeli technology comes as Saudi Arabia is under constant threat from Iran-backed Houthi rebels in Yemen. The rebels, who have been fighting the Saudi-led coalition in Yemen, have launched several ballistic missiles into Saudi Arabia lately. Two missiles were launched in November and a third one was launched in December with target set on King Salman’s office.